I mentioned in an earlier post that my daughter's pre-kindergarten class is waiting for three duck eggs to hatch. The eggs are inside a mini 3-egg incubator. On Thursday the teacher showed the children how to candle the eggs by shining a bright light through each of eggs. Apparently all the embryos are developing. We checked out a few books from the library about eggs and chicks this week. If you know of a children's book about ducks and eggs, let me know! 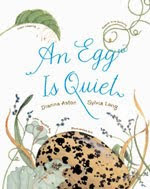 An Egg is Quiet by Dianna Aston, illustrated by Sylvia Long. This informative and detailed book has gorgeous ink and watercolor illustrations of various eggs from numerous different types of species (over 60). My daughter was surprised how varied the eggs are in color, shape and size. A detailed egg diagram shows the parts of an egg. The main text uses the repetitive phrase, "An egg is..." to talk about egg differences. Beautiful book! We picked this book up for its unusual engraved illustrations. Appropriate for toddlers and preschoolers, the simple, repetitive text tells about a little chick that explores the farmyard and listens to the noises the other animals make. He meets pigs, ducks, cows, frogs, and lambs and heads back home to his mom and has plenty to say after his journey. The eye-catching engravings make this book stand out from other barnyard animal books. My daughter loved the duck illustration, of course! Three stories in one book, this gem by Amy Hest is a quiet and thoughtful storytelling read. 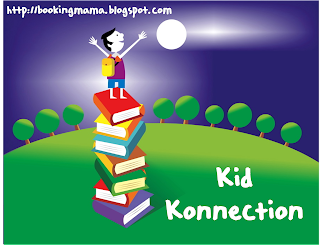 The short entries include "The Carrot That Would Not Grow," "The Kite That Would Not Fly" and "The Starry Night." 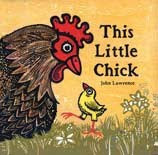 In all the stories a wise and kind Old-Auntie chicken patiently offers guidance to a yellow Little Chick. Kids will sympathize with Little Chick's frustration. My daughter commented that she has a hard time making kites fly, too. Anita Jeram's soft watercolor illustrations pair wonderfully with the gentle tone of the stories. 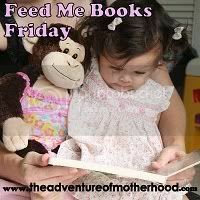 Link up your weekend book posts at Feed Me Books Friday hosted by The Adventure of Motherhood, What My Child is Reading at Mouse Grows, Mouse Learns and/or Kid Konnection at Booking Mama. The cover of This Little Chick is gorgeous, so I bet the book is too. These are great! We just read a book about a duck family called This Way, Ruby. 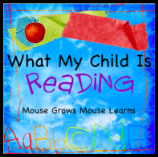 I think I mentioned it in my What My Child is Reading last week. It doesn't talk about eggs though. I love how your scheduled your books to go along with what is happening in real life with your daughter. My daughter has a b-day coming so we are reading b-day books. She seems to understand the concept now and I think she will enjoy her party more b/c of it. I just did a quick search at Amazon, by typing in duck egg, and then hitting children's books - and there are some very cute looking ones. If I can find any at the library, I'll let you know how they turn out! Thanks for joining and sharing your picks! How exciting about the ducklings - your daughter's preschool program rocks! Thanks for joining and sharing your picks. We read a book called Eggday which has a duck as one of the main characters. 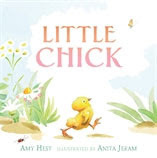 And we just happened upon Baby Duck series by Amy Hest which Anna quite likes this week - now I will keep my eyes open for Little Chick. How fun for you daughter waiting on ducklings to hatch! I'll have to look for these books. We have chickens down the street from us so I'm sure my kids would get a kick out of these. I'll have to check out those links too! thanks!